There's a famous hagwon here in Korea which likes to hire teachers as independent contracts. CDI, or Chungdam Institute, one of the top hagwons in Korea regularly does this. While some people like this since there are less deductions, no health insurance or pension is taken out, other people dislike it for this exact reason. 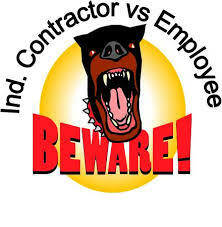 Here's the low down on ICs (independent contractors). Here are some more articles about ICs in Korea. ESLCafe: Independent Contractor - making it work for you.